First the good news: this was a well-sung Magic Flute. 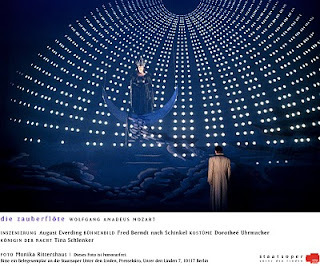 No one seriously disappointed and there were two stellar performances, from René Pape and Hanno Müller-Brachmann. The beauty of the former’s voice, his evenness of tone, and his authority could not be bettered as Sarastro. Indeed, I am not sure I have even heard better on recordings. One would never have guessed that Müller-Brachmann had been singing Mahler the night before, for he sounded as fresh as could be. 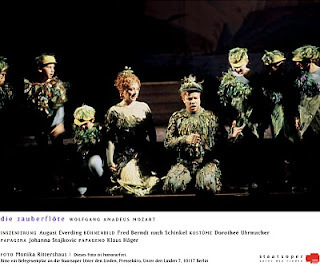 Musical line, poignancy, attention to words, comic timing, that ineffable Viennese quality: everything one could wish was there for this Papageno. And he really can act – which is just as well, as I shall explain below. As Tamino, Benjamin Bruns certainly had his moments. There was some beautiful singing to be heard, but also a little crooning. Ailyn Perez was a perfectly decent Pamina, whilst Sen Guo had a more than respectable stab at the impossible role of the Queen of the Night. Papagenas do not have that much to do, and rarely if ever linger in the memory, but Rinnat Moriah played her part well. There was also much to credit in Andreas Bauer’s Speaker, words and vocal line presented with an authority in which one could believe. Unfortunately, there is more to opera, and more to this opera, than singing. The Staatskapelle Berlin, which can sound truly magnificent in Mozart and much else, was having something of an off-day, though one could hardly blame the orchestra. Frank Beermann, whom I have not previously encountered, had no apparent affinity with Mozart; even his command of the score seemed shaky. The Overture was rushed and relentless. Tempi rarely sounded settled, changing for no discernible reason part-way through. Insensitivity was the hallmark of this account. Most worryingly of all, there were numerous disconnections between pit and stage. 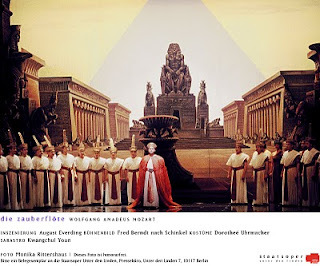 On one occasion, the Three Boys – sung winningly by members of the Aurelius Sängerknaben, Calw – were more or less abandoned; they seemingly had to come to the conductor’s rescue, rather than the other way round. Worse still, there is no discernible direction of the singers on stage at all. Müller-Brachmann’s experience tells, in that he can essentially create the part himself. But many of the other artists, quite understandably, flounder. At one point, members of the chorus seemed on the verge of dissolving into laughter, as they were made to perform a silly dance, whilst the Three Ladies were left to wave their arms around, to an effect that could hardly be explained away as ironic. The animals do no harm, I suppose, but their direction once again seems hapless, without quite being able to degenerate into camp. Where there was sign of a directorial hand, in the final scene, it was very much to the detriment of the work. The Queen of the Night simply stays on stage – so much for her downfall – without the slightest indication of why this should be so. Moreover, Papageno and Papagena return, with a host of children: more grist to the mill of sentimentality. It was enough to make one wish for Calixto Bieito. Superb review. Was at same concert. One wants to hear Pape again and again. Could do worse than the Schinkel sets. Have seem many dreadfully staged Magic Flutes.